Digital Audio Tape is a magnetic tape that permits to record audio. The recording is digital, its quality is similar to that of a compact disc. It was developed in the 1980s to replace the compact casette. Like tapes used for recording video, the tape can only be played in one direction, the "cassette" only has one side. It competed with Digital Compact Cassette (DCC), and the Minidisc. Unlike these however, it allows for an exact digital copy of the source; DCC and Minidisc use lossy data compression. 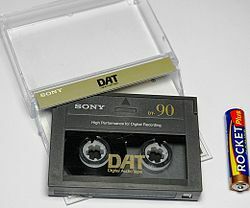 DAT tapes were also used to back up computer data in the 1990s and early 2000s. Most computer DAT drives will not read audio DAT tapes. This page was last changed on 2 December 2017, at 20:59.